In this video and blog post I will show you in just a few steps how you can activate your Windows Azure benefits included in your MSDN Subscription to enable your personal private Dev/Test environment in the Cloud. 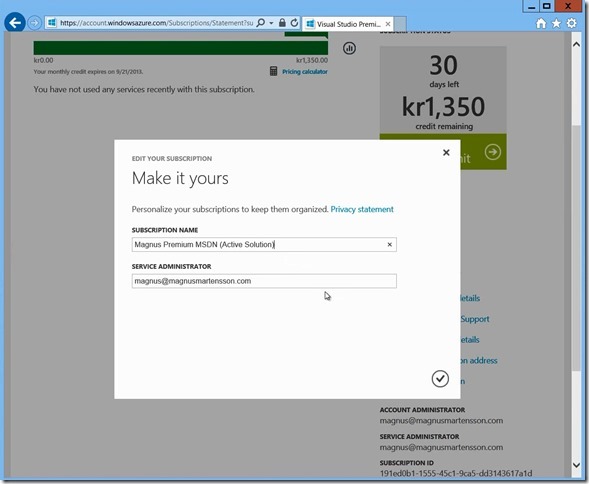 Each month your credits are reset and you can just continue to use these included benefits as long as you subscribe to MSDN! 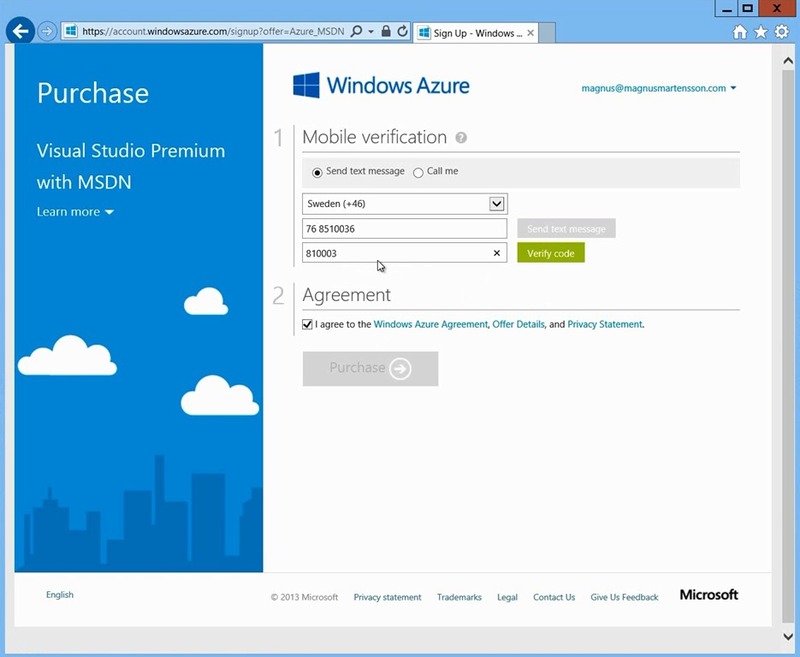 MVPs listen up – you already own a piece of Windows Azure! If you are a Microsoft Most Valuable Professional you already own a Dev/Test environment in Windows Azure which you can use for free each month. Adding to that and sounding like a TV-salesman – no credit card required. 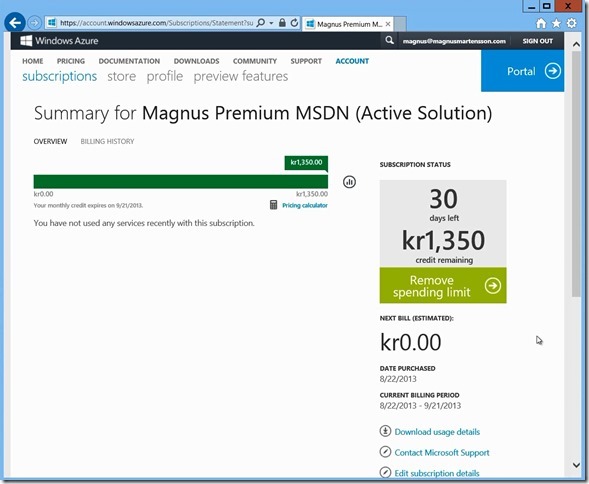 All you need to do is activate the MSDN benefits for Windows Azure and you can get started trying this out today! Activation is a really complicated and lengthy process – #NOT! It took me two minutes to activate. 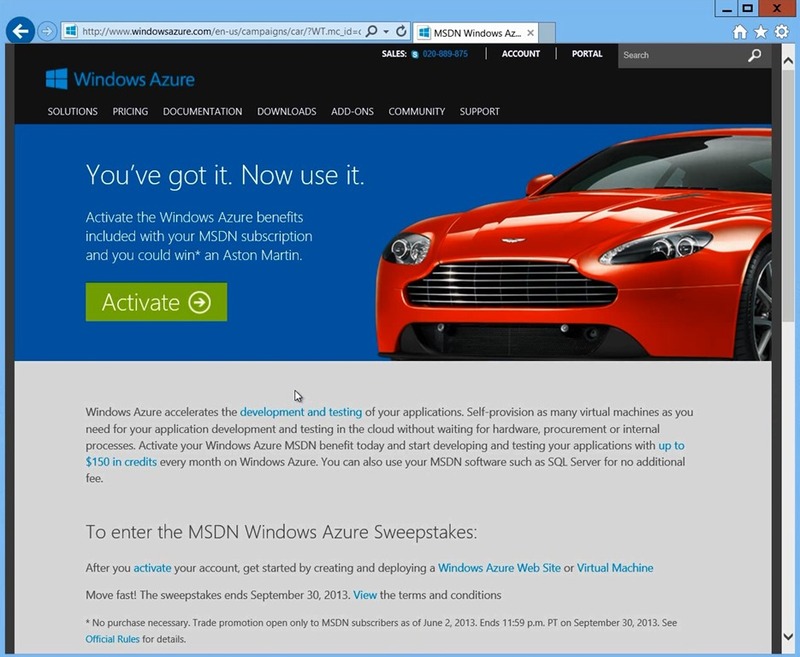 In fact anyone who subscribes to MSDN owns a piece of Windows Azure! 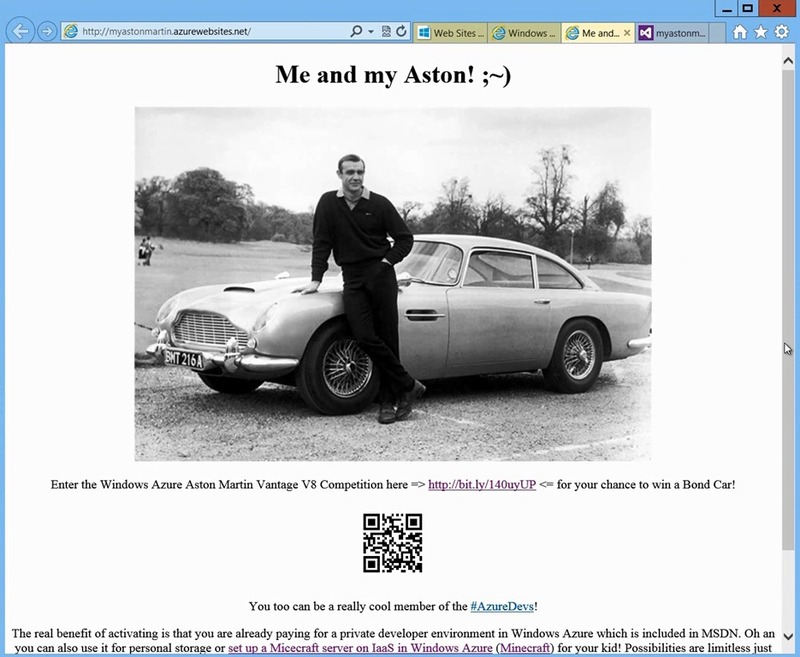 If you take just one step further, activate now, and then simply deploy a common web site to Windows Azure you are also entered into a sweepstakes for an Aston Martin Vantage V8! Yup now I do sound like a used car salesman now but hey – everybody wins just by activating and taking advantage of the benefits already included in MSDN so there is no harm in also entering the competition. In this blog post I will show you the two small steps you need to take to do this activation and deployment but there is also a YouTube video for you to look at if you so prefer! When you do activate please use the following link because I am also competing, not for the car, but in the game of helping the most people do this activation. Here is the full video – do enjoy it! 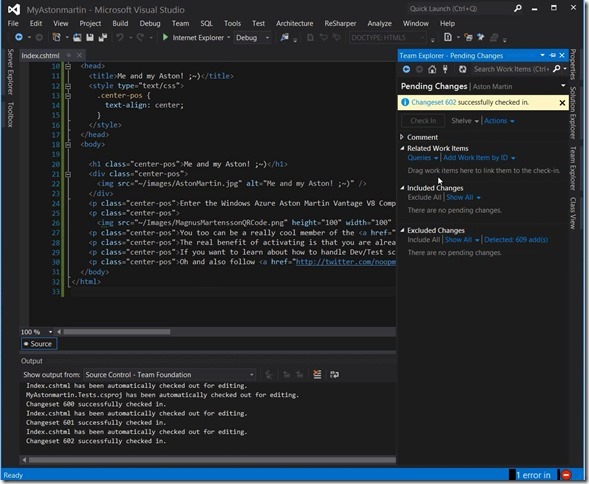 * You can deploy to Windows Azure Web Sites in many different ways and you can learn more about this in my Windows Azure play list on YouTube. Enjoy it and learn some other ways to put your web applications on Windows Azure! For those of you who prefer you can follow this step by step guide to enter the Aston Martin Vantage V8 sweepstakes! 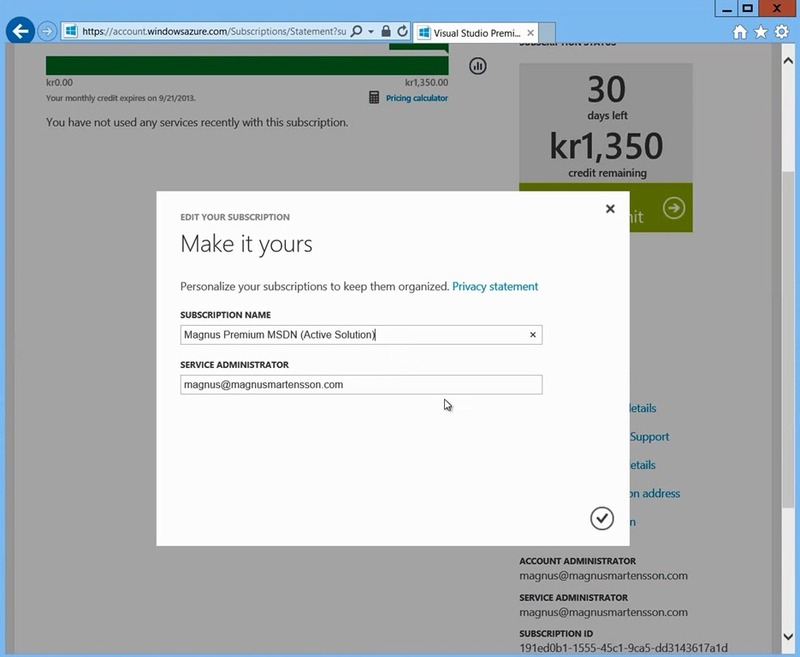 Then you login using the Microsoft Account (the artist formerly known as Live ID formerly known as Passport) where your MSDN Subscription is registered. 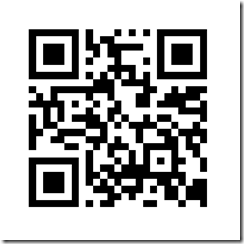 Following login there is a two step activation procedure: 1) Mobile Verification with a text message verification code. 2) Accept the agreement. There you go! You are now done with the first step! 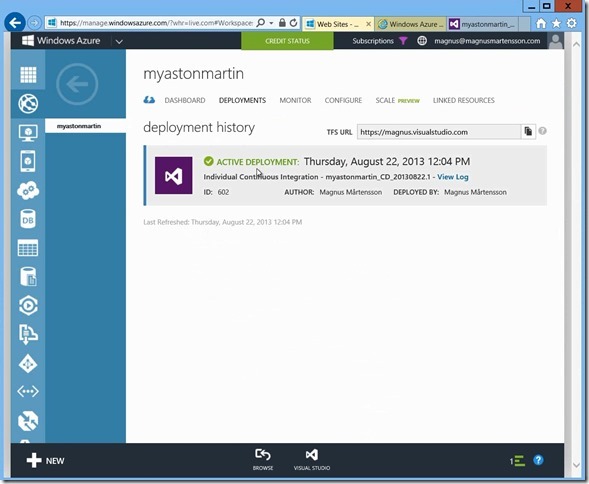 Your Windows Azure Dev/Test environment is activated! Optionally you can “Make it yours” by clicking on the account and then edit account details in order to enter a more useful subscription name than the generic default one. I entered Magnus Premium MSDN (Active Solution) since it was my company supplied MSDN account I activated. There. Now it looks much better! As you can see here (in Swedish Crowns) the monthly remaining credits are listed along with the number of days remaining until my credits are reset. Now lets look at the second step of two you need to complete in order to enter the Aston Martin Vantage V8 competition. 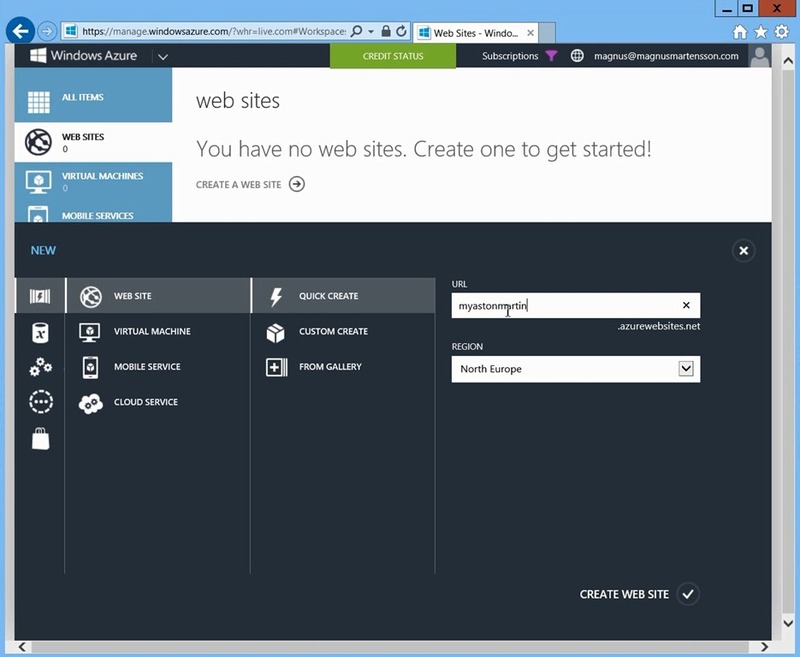 Again you can deploy to Windows Azure Web Sites in many different ways and you can learn more about this in my Windows Azure play list on YouTube. 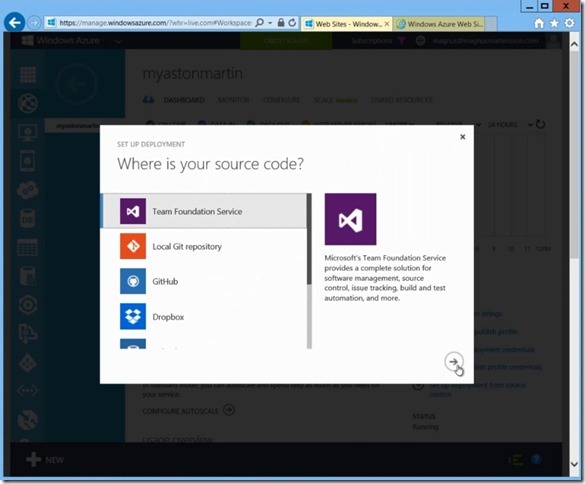 In this example I will use Team Foundation Service to link up a pre existing repository to my Web Site and have it be continuously deployed to Windows Azure on every check in (Continuous Integration). First you click on the Portal link (from the picture above). 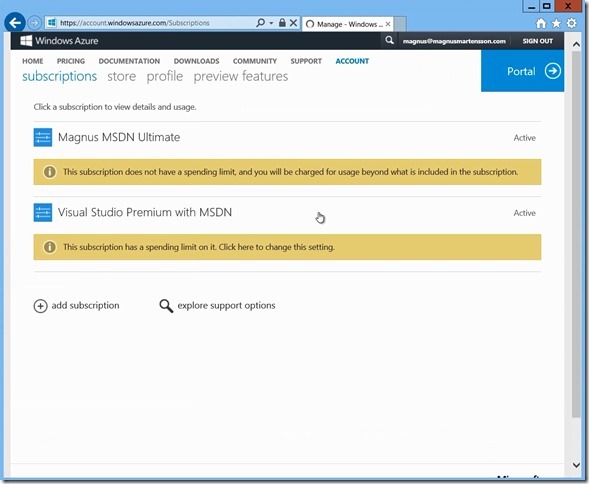 This will take you to the Windows Azure management portal. Then you click on “Web Sites” in the left hand menu and then on “Create a web site”. Alternatively you can just click on “New” at the bottom of the screen and drill down to Compute –> Web Site –> Quick Create –>. Enter a name that has to be globally unique. Select the Region where to deploy your web site. I selected North Europe because that’s closest to me. Then hit Create Web Site! The Windows Azure Web site is now created and you can browse to the public web site. 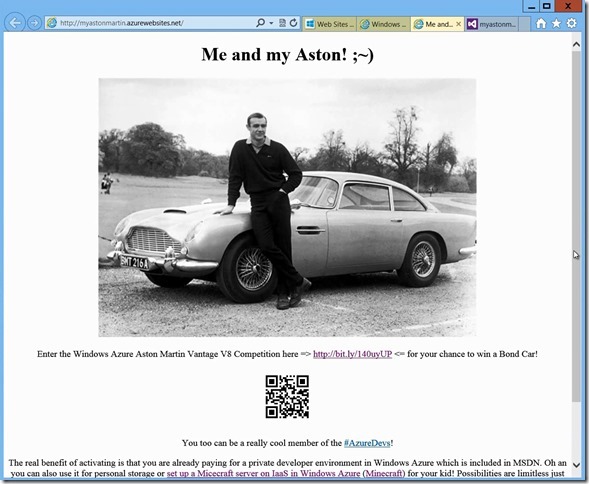 This is what my web site looked like: http://myastonmartin.azurewebsites.net Because the site has just been created but there is nothing deployed to it there is just a template site for now. Next step is to connect the source code repository and have continuous delivery automatically setup. You click on the Web Site you created and then on and then on “Set up deployment from source control”. Pick the first option Team Foundation Service and hit next. There is a bit of an issue here. If you don’t have an account at Team Foundation Service or don’t have a repository ready there with the source code of a Web Site checked in you cannot follow along any further. The registration of a Team Foundation Service account and the setup of a repository with web site source code is not in the scope of this blog post. If you wish to know more about this you can simply contact me through this site or ping @noopman (me) on Twitter. 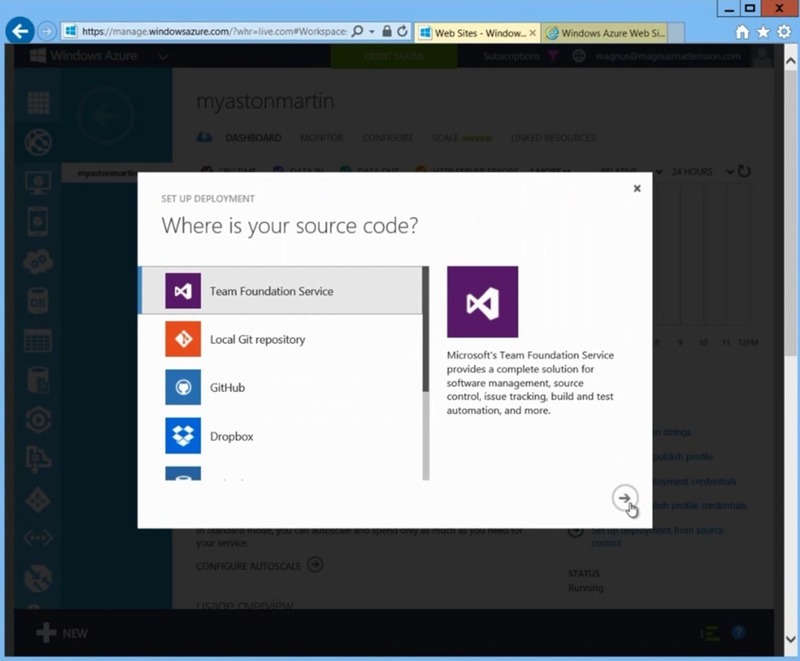 The following steps are to select your Team Foundation Service. 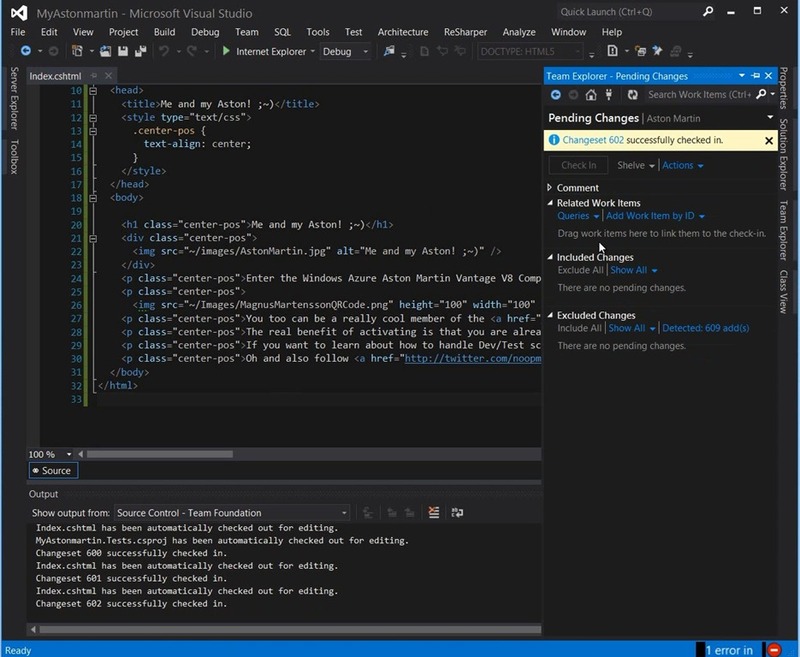 Mine is magnus.visualstudio.com which I think is really cool. You should register your personal name or your company name now before someone else steals it! Then you do a one time premission grant to allow TFS to interact with Windows Azure and finally select the TFS project you wish to link to. As you can see the message says that there will be an automated deployment “on your next check-in”. 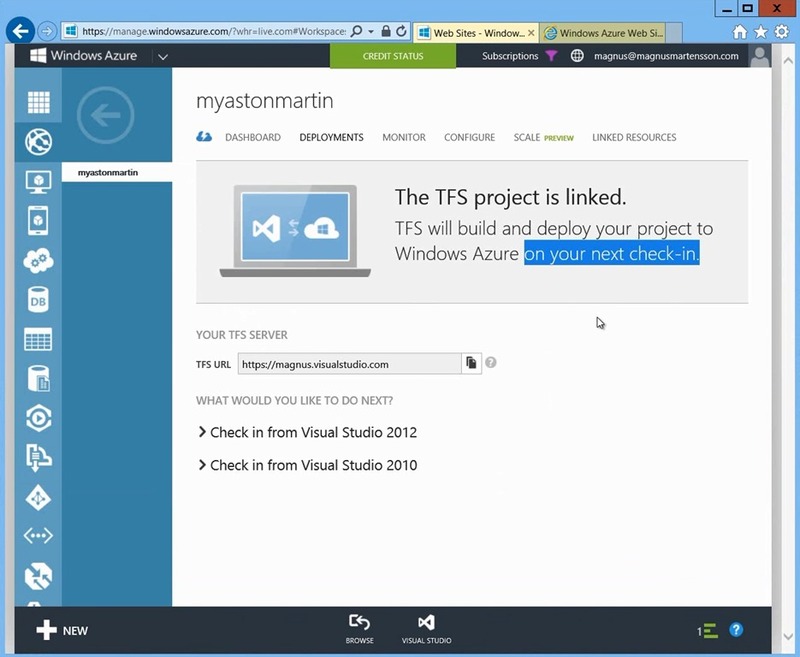 You open up your solution in Visual Studio, make a small change and check the change into your TFS project. This triggers the build script to run. 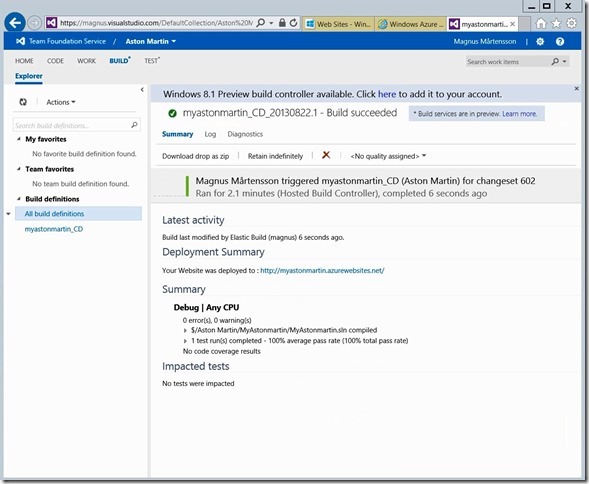 Over in the Team Foundation portal you can now drill down to “Build” –> “Queued” and see the build as it happens. Code is built, Unit Tests are run, a deployment is made to the web site we have allocated. 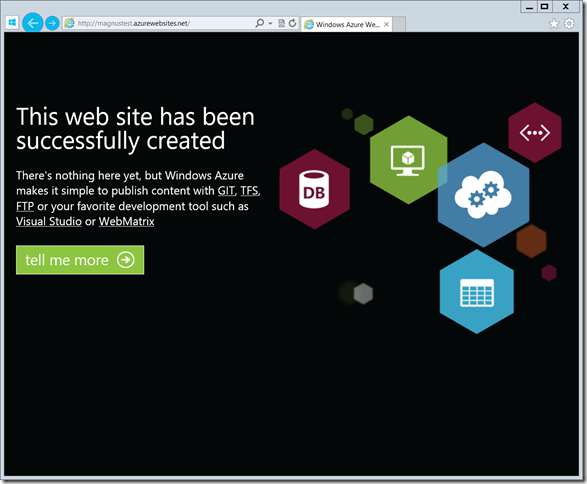 Once this completes over in the Windows Azure portal you can now click on Deployments and see that there is indeed an active deployment for your web site. 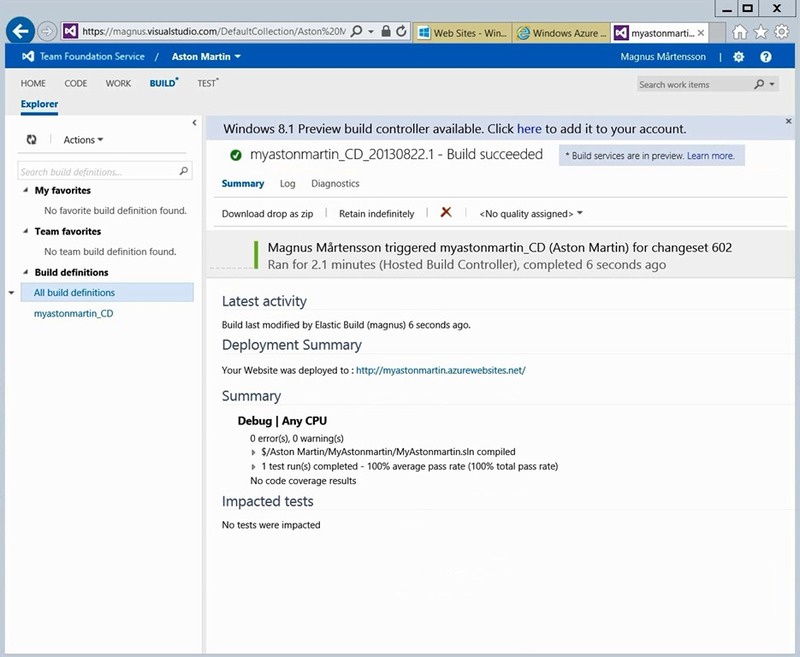 #1 benefit of following these steps is that you enable your own personal Dev/Test environment in the Cloud! #2 benefit is that you begin to learn about the #awesome Windows Azure platform. #3 benefit is that you also have a chance to win an Aston martin Vantage V8. That’s all! Thanks and see you next time – have fun out there in the Clouds and drive safe!